This post is part of a continuing series of guest posts. Jenni Romaniuk is an Associate Research Professor of Brand Equity, Ehrenberg-Bass Institute, University of South Australia. This post is a summary of an Ehrenberg-Bass Institute corporate member report written in conjunction with Nicole Hartnett, Research Associate at the Ehrenberg-Bass Institute. Distinctive assets are non brand-name elements that are able to evoke the brand in the memory of consumers. Some of the most famous examples include the Nike ‘swoosh’, the Aflac duck and Mastercard’s priceless advertising. All of these elements are able to represent their brand name without needing any other prompting. Many creative elements have the potential to become distinctive assets including: logos, slogans, colors, shapes, typefaces or fonts, characters, celebrities, jingles and/or music, sounds, advertising style, tastes, textures and scents. Uniqueness – To what degree is your brand only linked to the element? When consumers link multiple brands to an element, brand confusion ensues. Ideally, marketers want to develop brand assets that are unique in their category. Prevalence – How many consumers link your brand to the distinctive element? The more consumers that are able to identify your brand based on the asset, the stronger and more valuable the distinctive asset becomes. Simply put, distinctive assets are more creative alternatives to directly showing a brand name, and they help create a larger brand footprint when elements are used in conjunction with the brand. Marketers can use non-word elements such as color, visual images, and sound to provide a multi-layered process for entry into consumer memory. On the consumer end, brand assets simplify brand identification outside of the advertising context, for example on-shelf or as a retail outlet. How does an element become a distinctive asset? To develop a distinctive asset, marketers need to make a commitment to consistent co-presentation of the element and the brand name across all consumer touch-points. Then, consumers must learn to associate the element with the brand. Whether a brand has already developed distinctive assets or is embarking on creating elements, the main question marketers need to answer is: “Do consumers recognize my brand?” Throughout this process, keep in mind that for an element to be a distinctive asset it must evoke the brand, without prompting, for close to 100% of consumers. Only then can the distinctive asset be considered strong enough as a unique brand identifier. Ultimately, distinctive assets can replace the brand name in marketing initiatives. I have created the Distinctive Asset Grid to enable marketers to classify their brand’s distinctive elements. The grid is divided into four broad quadrants, which each represent the current state and future potential of a distinctive element. Use: It is a strong distinctive element that evokes the brand from memory for the vast majority of consumers. Distinctive assets that fall in the “Use” quadrant are highly differentiated from those of competitive brands. Therefore, assets in this quadrant can be used to replace the brand name in advertising. Invest: The element has unharnessed potential: it meets the most important criteria and it is highly unique to the brand. However, not many people are aware of the asset (low prevalence) which restricts its ability to be used in place of the brand name. To further cement the element, it should be co-presented with the brand name. Avoid: If the asset falls in the “Avoid” quadrant, marketers should be wary of using the element as an alternative to the brand name. Otherwise, the element may bring competitors to mind for consumers. Ignore: An element in this quadrant is best unused in its present state. The exceptions are elements that are at the beginning of their development, as the majority of new elements have low prevalence and uniqueness. However, if an element’s uniqueness and prevalence have not developed after receiving proper marketing support, then the asset should be reconsidered. 1. Are there any drawbacks in using distinctive assets for brand identification? While distinctive assets represent some opportunities, they also present some risks. If you use the brand name to identify the brand in advertising, all who notice the brand name will know that it is that brand that is advertising. However, if you only use a distinctive asset to identify the brand, and it is not 100% unique and prevalent, there will be some people who see the distinctive asset but don’t think of the brand name. These are wasted exposures. There is good reason to be cautious about selecting elements with strong meaning to develop as distinctive assets. Firstly, the strong meaning will hamper the brand’s ability to attach the brand name to the distinctive asset. This meaning will be evoked in consumer memory when the element is presented, which will then dominate and interfere with the development of links to the brand name. Secondly, you can’t control the consistency of this past meaning. Finally, what if the core meaning of the brand changes over time in response to consumer or market trends? The distinctive asset will also need to change, negating the value of past investments. Pundits everywhere are speculating on the damage to the Tiger Woods brand. But what about the corporations and brands he pitches? CMO’s must always remember that celebrity endorsements are a “double edged sword” that carry both benefits and risks alike. Tiger Woods - What Impact on Sponsored Brands ? I’ve written previously about the importance of Marketers contributing to corporate reputation efforts (Should Marketers Care About Corporate Reputation? ), but the Tiger Woods story presents a new angle: how celebrities impact corporate and brand reputation. How does Tiger’s presence and performance affect PGA Tour TV ratings ? What impact will his absence have ? What do we know about the effectiveness of ads which featured Tiger Woods versus those which didn’t ? What impact has the late night talk show monologues, riffs, and skits had on Tiger’s sponsored brands ? Assume the Worst – CMO’s should assume that any celebrity they use in their Marketing, no matter how seemingly “pristine,” will have an issue at some point. And with the web’s ability to spread “spurned media” at an unprecedented rate, brand damage can be fast and severe. Diversify your Marketing Assets – Put simply, brands should use celebrity endorsements as one element of a multi-faceted Marketing program. Building your entire Marketing program around a single celebrity and related creative idea can put the brand at serious risk if problems arise. Have a Back-Up Plan – If disaster strikes, brands must be prepared. What’s the plan to deal with any celebrity disaster fallout, including the digital trail of negative media that will live on for months and years on the web? And what’s the back-up Marketing plan? It all reinforces an important, but oft forgotten point about the “double edged sword” of famous spokespeople: brands can benefit from the association of a strong spokesperson brand–but face the constant risk of that reputation turning negative, no matter how unlikely it seems. Accenture, Cadillac, EA Video Games, and others are relearning this lesson all over again while they recover from the collateral damage of a spokesperson gone awry. Should Marketers be in the Business of Selling Media ? Target’s announcement this week that they’ve struck a media deal with Daily Candy is, on the surface, a straightforward attempt to monetize their large web site traffic and create a new revenue stream. Daily Candy is a free daily e-mail from a website which focuses on leading edge fashion, food, and fun. Target has been advertising in DailyCandy e-mails for some time now. The deal, announced on Monday, creates a co-branded “Red Hot Shop” in collaboration with Daily Candy, which features “a monthly dose of chic, unique, and sometimes offbeat” in the form of DailyCandy editors product picks on the Target web site. Is this a smart new Marketing idea that other Marketers should emulate ? Or, is this nothing more than a brazen play to generate a new revenue stream during a very challenging and difficult economic environment ? It all starts with the Brand and the key equities you want to own. Target has done a great job over the past ~10 years of establishing itself as the mass merchandising retailer that brings you fashionable products at a reasonable price. DailyCandy squarely fits the Target “fashion” equity and brings an element of street cred as well. Do you have the same target consumer ?If so, it might make sense to evaluate a media partnership like the Target / DailyCandy one. In Target’s case, both Target and DailyCandy are focused on women interested in fashionable merchandise and ideas. Do you share the same brand equities ?If not, you risk diluting your brand by devoting valuable web space to a brand that doesn’t reinforce and support what you want to stand for. What I really like about the Target / DailyCandy partnership is their focus on leveraging the DailyCandy fashion expertise and equity–similar to Target’s–to recommend products for sale on Target’s web site. Would a media partnership help achieve your marketing objectives ? Building your core brand equity is a never-ending objective. Target also has the potential to bring in new shoppers and/or increase share of wallet via new merchandise. Does the economic model make sense for both partners ?You’re giving up important real estate on your web site. There is an opportunity cost to devoting your space to someone else–does the partnership deliver a better financial return? It sure looks that way–Target leverages DailyCandy’s fashion expertise and street cred to sell more product, while DailyCandy benefits from Target’s large consumer reach and advertising. And they both build their “fashion” equity. It’s gonna be a bright and sunshiny day. 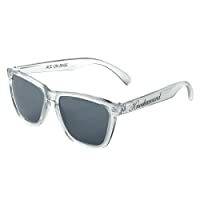 Make sure you can see clearly with a rad pair of Knockaround premium shades. Scratch– and impact–resistant lenses guarantee proper peeper protection. I’ve always admired Target as a leading retail Marketer (one of the few), and this is another great example of them innovating through media, web and smart partnership marketing. You are currently browsing the archives for the Co-Branding category.